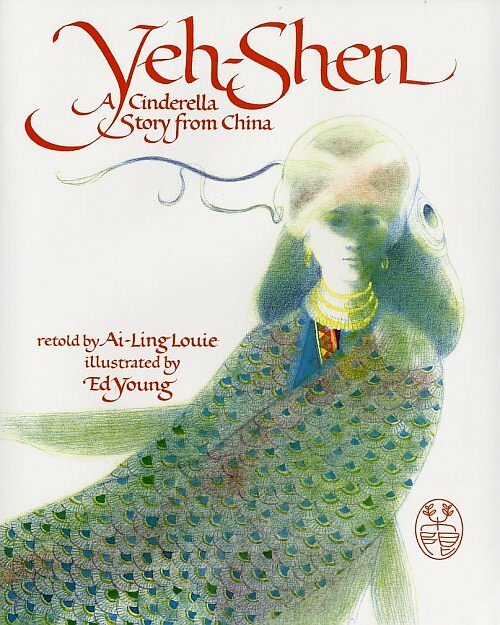 One of my favorite inquiries is to deduce and compare the values of different cultures based on their “Cinderella” stories. Probably the oldest, and my personal favorite, is Yeh-Shen from China. On Thursday evening, we held a presentation and meeting for students, parents, and teachers to learn about and discuss our school’s inaugural PYP Exhibition to be held in about two months, on 26 April during our International Children’s Day event. I began the meeting by reviewing the description of the Exhibition on the International Baccalaureate Primary-Years-Program website and the directing everyone to the Exhibition Guidelines for further details. I was happy to field many questions, which made it more conversational than a typical presentation. It was also an indication that the ‘zen’ of my slides was effective at stimulating thinking rather than simply containing information, a goal I set in the post Exhibition pre-Zen-tation. Exactly the kind of energy we’re looking for during this collaborative adventure. 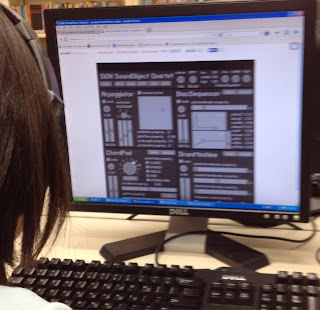 After the presentation, we visited the JIES Grade 6 PYP Exhibition Wiki. All of the students’ preparations and presentations will be linked to that web page, so it is important that everyone know how to find and make sense of it. I could see relief in the parents’ and administrators’ eyes when they saw an organized way to document specific learning during what is, by necessity, a very nebulous ‘assignment’. Finally, we discussed and agreed to our PYP Exhibition Essential Agreements. These were created collaboratively in class. Please note the inclusion of all of the PYP Attitudes. Everyone seemed satisfied with them as they are, so we agreed and adjourned the meeting. In the interest of transparency, all materials were posted on our class blog in a post similar to this one. I’m most excited to see how the students react to having the BYOD (Bring Your Own Device) policy. My hope is that being trusted to use their tablets and smartphones will inspire them to truly integrate the technology and connectivity into their learning, even if only after a bit of goofing around. Very excited to get started on Monday and hope that my colleagues around the world will share and reflect online during this special time of the year for so many PYP students. For the past few weeks, I have enjoyed looking forward to my ‘Music with Computers’ after-school class on Wednesdays, for 2nd through 6th grade students. It’s a ten week course. During the first five weeks, I introduced various creation tools. The second half is for exploration, experimentation, composition, and creation. The availability of intuitive, expressive, professional, free sound creation tools is exploding. I’ve enjoyed exploring to find a few of the best to share with students, as well as a few teachers who happened to be in the media center on Wednesday afternoon, and I would like to share them with you! I was lucky to study electronic music with classic analog synthesizers and can confidently say that SiON SoundObject is the next best thing, and significantly easier to use. 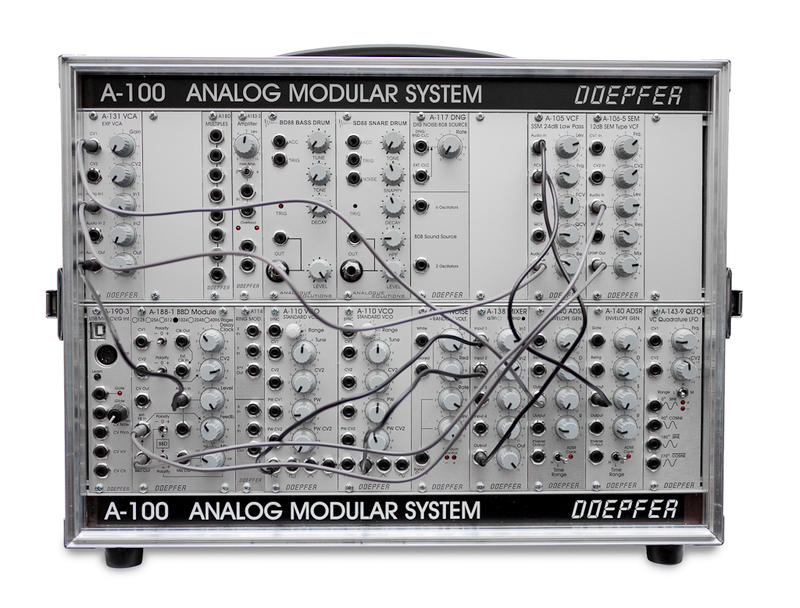 Students love creating wild sci-fi sounds with this synthesizer! Drum Machines have become the backbone of popular music. 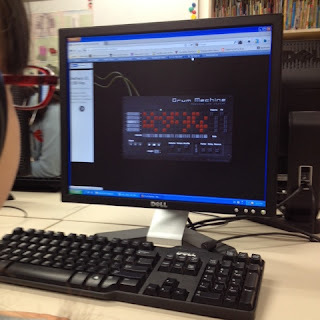 There are two online drum machines I recommend for elementary students, One Motion Drum Machine and Drumbot. One Motion is very easy to use and has good ‘physical’ controls making it perfect for young learners and beginners. It is, however, part of a suite of applications including very distracting games, so students need frequent reminders to get back on task after their ‘game breaks’, although I have observed that the games are well designed for fine-motor and mouse tracking skills. Although Drumbot is a bit trickier to operate, it is much more flexible and mimics current professional controllers like the Dave Smith Instruments Tempest. Patterns can be saved and looped, reorganized, and special effects added and manipulated in many ways. Finally, it allows users to save their creations, which will become a popular feature among my students as they begin producing more music that they want to share with friends and family. Soundation is a virtual studio, sequencer, and social network, all in one. As with MuseScore, users create and share their music in a vibrant collaborative community. It is almost identical to professional digital audio recording software like Pro Tools, although simpler and less powerful. Older students have been highly engaged with it from the beginning, and I can’t wait to hear the music they will make as their skills and visions grow. All of the links for these tools are kept on a simple Music with Computers wiki, which was emailed to parents after the first session. Evidently, students are visiting the sites at home because they come to class with new tricks to share and I’ve received emails from parents expressing thanks for collecting fun and engaging resources! I hope you enjoy them as well. I also created a JIES Music account on SoundCloud, to which I plan to upload recordings in the future. I hope to hear more recordings of students’ music there as education and art become more networked and digitally connected. As Greg would later observe, it snowballed from there. Several Tokyo and Yokohama teacher-leaders joined the organizational team. 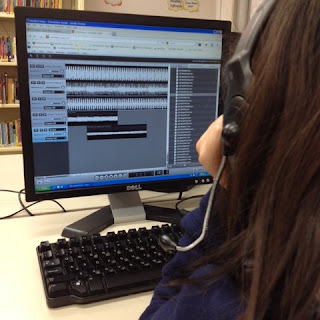 We set up an Edcamp Tokyo website, held a Google Hangout with Edcamp Foundation Board Member, Kristen Swanson, settled on a location, Yokohama International School, and a date, March 15. With only four weeks to go, there are currently more than fifty dedicated educators registered and conversations percolating on our Edcamp Tokyo Connectivity page, Edcamp Tokyo Google+ Community, Edcamp Tokyo Idea Wall, and of course around the #EdcampTokyo and #Edcamp東京 hashtags on Twitter! This is the first chance for educators in Japan to assemble for self-directed, collaborative professional development. Even those outside of Japan might be interested in our activities, especially as they pertain to inquiry-learning, multilingual and third-culture education, technology, and whatever inspiration may strike! I can’t wait to see you there, in person or virtually. My class had an outstanding field trip today, in connection with our unit of inquiry into the effects of changes in science and technology. We recently completed a modeled inquiry into 3D printing, introduced in the post, Modeling Inquiry. 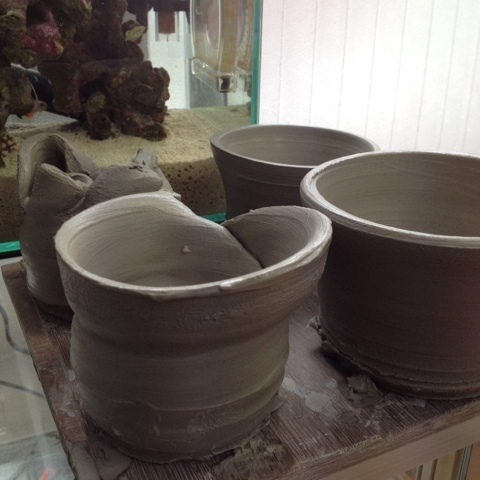 Having delved into the future of manufacturing, a visit to Uzumako Ceramic Art School was ideal to provide perspective by experiencing one of the world’s most ancient crafts, pottery. 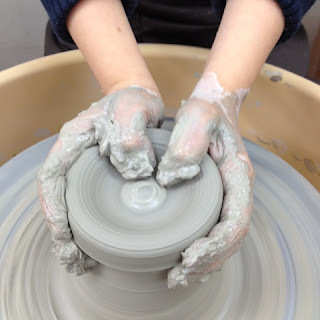 My own visceral reaction to wet clay covering my hands, but more importantly the focus and creative energy emitted by students, was all I needed to know this was a deep and invaluable learning experience. The teachers at Uzumako were patient and knowledgeable, and fluent in Japanese and English, so it was truly ideal. For inquiry, experiencing this ancient technology through our hands illustrated a connection to the past that can’t be explained with words. Perhaps that’s a good definition of Deeper Learning, that it can’t adequately be expressed with language. Seeing students with clay-covered hands, satisfied smiles, and creative sparks in their eyes is enough to make the day of any teacher. 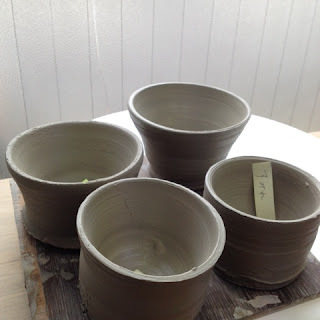 If you have a chance, I highly recommend visiting your local pottery and ceramics class! As part of my inquiry into Visual Literacy, I have taken up photography as a hobby. I think that hobbies don’t get enough credit as deep, informal learning experiences! 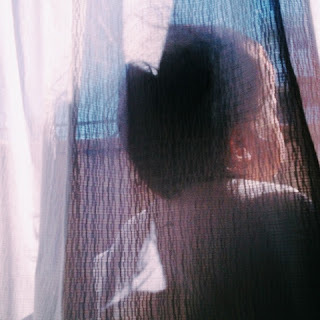 In this photo, my first of an artistic nature, I tried to capture the wonder my son expressed as he felt the sunshine and surveyed the snow-covered rooftops all around outside after Tokyo’s heaviest snowstorm in more than forty years. If you are interested in following my new fotomania, please find my photo feed on Instagram. My Grade 6 class is currently embarking upon their PYP Exhibition. It is the first event of its kind at my school, and one of my responsibilities is to make a presentation for the parents and school community about it. The fact is, the Exhibition is a gargantuan task. The event itself represents the culmination of all learning and growth in a child’s life to this point in time. Also, it is not an ‘assignment’, but a framework or set of guidelines within which students pursue an inquiry for several weeks. It has structure and should occur at a particular time, but the nature of the inquiry and how it is expressed is up to the students. To help myself articulate the goals of our Exhibition, I actually started creating this presentation last summer. I suppose I should call it a pre-Zen-tation, because I was woefully unaware of design principles like those detailed by Garr Reynolds at Presentation Zen. What you see here was not finished. I simply saved a ‘before’ copy before beginning to edit according to my new insights into presentation design and visual literacy. Searching for images was easy enough, and I enjoyed the challenge of finding an image to represent each slide visually. Although I searched for Public Domain and Creative Commons Share-Alike images, I added them without saving their sources, which resulted in researching for them to be able to include credits. This would be a good time to express appreciation for Google search by image! In some cases, I found great images by one well-worded search. In others, one search led to another and another. Some images had the right idea, but didn’t work as slides. For example, the text I wished to include was difficult to read or there wasn’t enough variety when the slideshow was arranged in sequence. Images added, each slide took on a unique personality. Rather than being a place to put words, they became little conceptual stories. Viewing the slides conceptually, rather than as a means to present information, was my major turning point. It hadn’t occurred to me before to think of the slides as accompaniment, as opposed to background. Many words I had included suddenly seemed unnecessary, and I considered removing all of the words more than a couple of times. But as the presentation gurus all agree, each presentation has its purpose, and this is a presentation to communicate information, so the words stay. I did prune, however. The text on each slide are examples of ways we have practiced and developed the different 21st Century Fluencies during the year and what we expect to see during the Exhibition. Some were too vague, some too specific, and I still have mixed feelings about a few others. Indeed, this is the perfect time to put out a call for feedback and critique, so your comments are very welcome. Certainly an improvement. I can imagine that, while delivering this presentation, the audience will feel more connection and engagement with the information, and I will be more free to improvise with my speech to promote more interaction and feeling of collaboration that is essential to the Exhibition. There are a few elements yet to be added, such as a slide about the expectation for a service project and globally-significant issue, and I feel that after those additions, it will be further enhanced. I’m not satisfied. Reading so many great presenters’ emphasis on ‘story’ has caused me to reimagine my approach. Why not tell the story as a narrative? Why not introduce some drama? Could an emotional ebb and flow be integrated into what I have already created, or should I start from scratch? ‘…place these facts in context and to deliver them with emotional impact.’ Daniel Pink’s words as quoted in Presentation Zen haunt me. I’m going to use the presentation as it is now, or at least a similar iteration, since this meeting is imminent and there are too many other tasks demanding my attention now. I would like to continue this inquiry as my final project for the Visual Literacy course, however, with the goal of creating a presentation to capture the essence and complexity, passion and drama of the Exhibition.